The MS Miguel Torga is a premium-class ship that sails on the Douro river. It is the newest ship in the fleet and offers contemporary designs, a Sun Deck with panoramic views and other modern amenities. 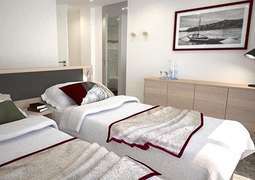 All cabins on board the MS Miguel Torga are designed to cater to your needs. Each cabin comes with its own bathroom and flat-screen TV, as well as a large picture window to allow for the best views you will find on the Douro River. Breakfast is served in a buffet-style, and dinner is served at set times each day. There is a pool with chaise lounges on the Sun Deck that also offers panoramic views of your destinations. Wi-Fi is available free of charge and a shop is also available.